SEOUL, South Korea (AP) — The main focus of outside attention to this week’s inter-Korean summit is whether it can find ways to resolve the stalemated diplomacy on North Korea’s nuclear program. Also at stake is what steps the Koreas will take to lower decades-long military tensions and improve ties. Since entering talks earlier this year, Kim has repeatedly promised to realize the “complete denuclearization of the Korean Peninsula,” but without providing a detailed timetable or road map for the process. Kim has dismantled his nuclear and rocket-engine testing sites and taken other goodwill measures, such as releasing three American detainees. His government wants the United States to respond by jointly declaring an end to the 1950-53 Korean War, but U.S. officials want Kim to take additional steps that can prove he’s sincere about denuclearization. Moon said Monday that he’ll mediate between Kim and President Donald Trump to help them settle their differences and move toward denuclearization. But his chief of staff, Im Jong-seok, had acknowledged earlier in the day that it’s “difficult to have any optimistic outlook” for progress on denuclearization during the summit. 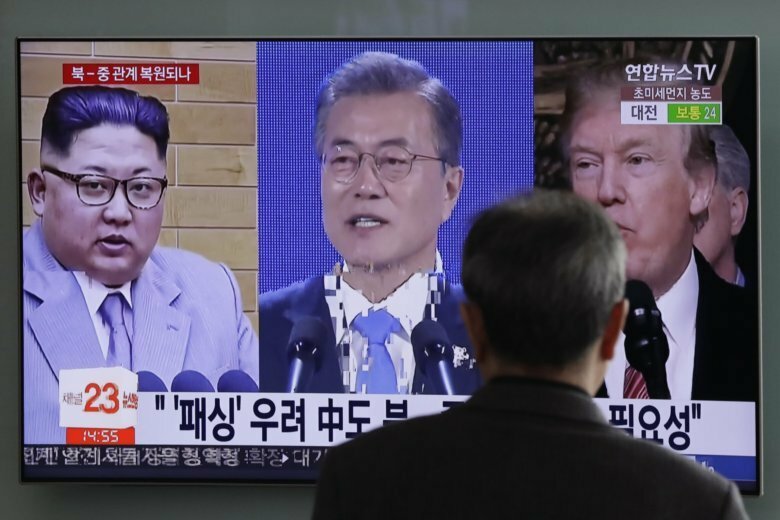 Some experts say Moon’s trip to Pyongyang could be successful if he gets Kim’s promise to submit an inventory of his nuclear warheads, fissile materials and other assets if Trump agrees to the end-of-the-war declaration. Moon — who brokered the historic Trump-Kim summit in Singapore in June — is expected to meet Trump on the sidelines of the U.N. General Assembly in New York later this month. Kim and Moon could agree on a package of steps aimed at drastically reducing their countries’ military standoff along their tense border. Their military officers have been working together to draft such steps since Moon and Kim agreed to eliminate the danger of war during their first summit in April. Im said Monday that he expects this week’s summit to yield “meaningful” accords that “fundamentally remove the danger of armed clashes and ease fears of war” between the two Koreas. The Koreas’ 248-kilometer (155-mile) border, called the Demilitarized Zone, is the world’s most heavily fortified, with hundreds of thousands of combat-ready troops deployed along a line that’s laced with mines, barbed wire fences and anti-tank traps. The countries’ poorly marked western sea boundary has been the scene of several deadly naval skirmishes in recent years. During the summit, Moon and Kim could agree on withdrawing guard posts inside the DMZ; having their troops disarmed at their shared border village of Panmunjom, the site of their April summit; and conducting joint searches for the remains of soldiers killed during the war in DMZ areas. Establishing a “peace zone” near the disputed sea boundary to ban the entry of navy ships and live-fire drills is also possible, according to South Korean media reports. The summit will also focus on how to further improve inter-Korean ties in line with what the leaders agreed to during their April summit. Some of the April accords have already been implemented, such as holding a temporary reunion of relatives separated by the Korean War, cooperating during the recently concluded Asian Games and establishing the Koreas’ first liaison office at the North Korean border town of Kaesong. Carrying out other agreements, such as reconnecting severed inter-Korean railways and roads and resuming stalled past cooperation projects, would be difficult, as it would violate U.S.-led international sanctions on the North. Moon is to take 16 business figures to Pyongyang, including Samsung’s de facto leader, Lee Jae-yong. They are to meet Ri Ryong Nam, vice premier of North Korea’s Cabinet, but it’s unclear what issues they’ll discuss. Some experts say Moon is preparing for the resumption of inter-Korean economic cooperation projects after diplomacy eventually yields results. Im, Moon’s chief of staff, said the summit could produce some “good news” over Seoul’s push for holding more reunions of separated families.